Still inlove with this look from when we went all rock'n roll with our Moschino teddybears and my fab vintage electric guitar bag. 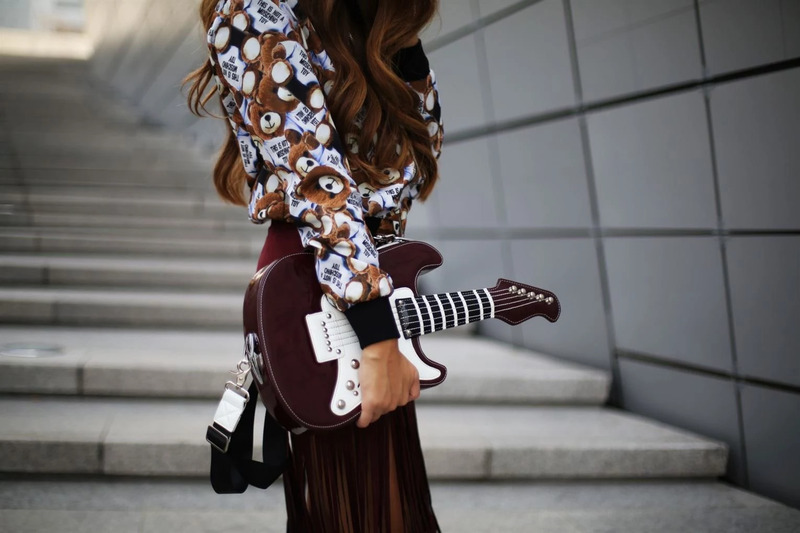 Even though I'm not a rock music kind of girl, I still love the rock style when it comes to fashion, at least in smaller doses like accessories or additions like fringes. And I think both me and J's fav color this fall is burgundy, it's just such a deep and seductive color. These photos are shot outside of DDP with a Canon lens 50 mm f/1.4 and I love the blurrieness and the depth in the photos, but when you work with photography like we do almost everyday, you get so picky and obsessed with improving. Right now we are looking at a new additonal lens and it stands between a 50 mm f/1.2L lens or a 35mm/1.8 lens. It's such a hard choice, but perfect timing since it will be a Christmas gift to ourselves!